Saw this product recently at a trade show, and thought man, do I ever need a couple of those. 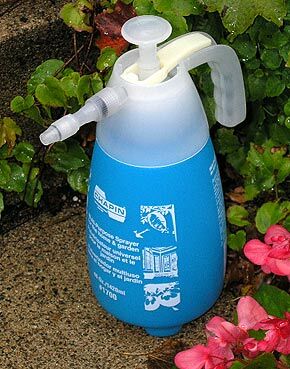 What’s so great about this product is the size, a mere 48 ounces, perfect for about ninety-nine percent of the chemical spray jobs you have around the garden, where filling up and lugging around a one- or two-gallon pump sprayer is a waste. The spokesperson from Chapin at the booth stressed the high quality and durability of their sprayers (they have a large line). Testing this sprayer, I can tell he was being flat honest. Just turning the spray nozzle you know you have a precision-made instrument in your hands. The spray pattern can be adjusted smoothly and flawlessly from a perfect mist (so fine you could use it to mist seedlings) to a straight stream, with all spray densities in between. Founded in New York in 1884, Chapin has been making hand and compression sprayers since 1903, and were the first company to patent a hand sprayer, in 1902. These sprayers were made from brass. If you run into an old Chapin brass sprayer at a garage sale, nab it—they bring in a few bucks from collectors. Chapin sells their sprayers all over the world, and if you walk in and buy Ace Hardware’s private label, 48-ounce sprayer, it’s made by Chapin and is the same as the one you see in the photograph.